She went to art school in Florence and worked as a graphic designer before making a life change and becoming a beekeeper and olive oil producer. Next to her farmhouse was an old stall and hay barn which she converted to two apartments and a double bedroom, all tastefully decorated with that artist’s eye of hers. 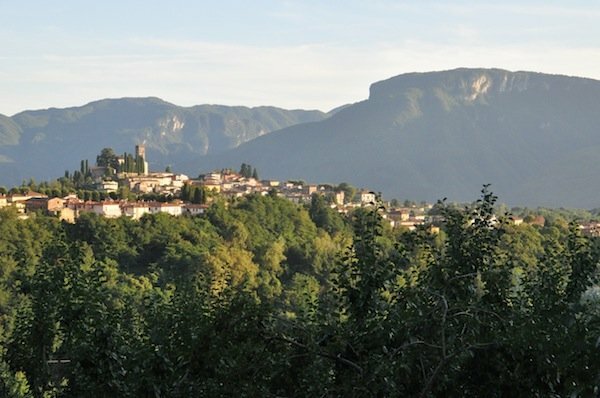 A second reason for staying is the incomparable view from your balcony of Barga in the golden glow of sunset. 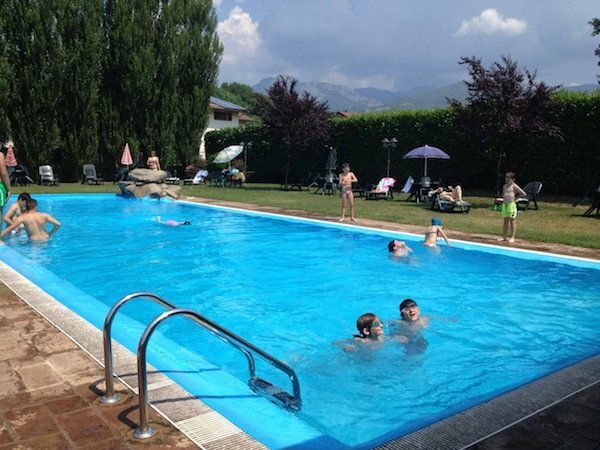 The swimming pool shares the same panorama. 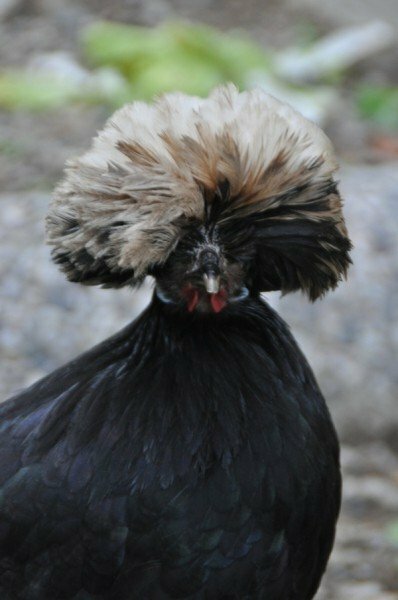 There are fashion chickens, a donkey and a vegetable garden, herbs and fruit trees from which you may pick your fill. 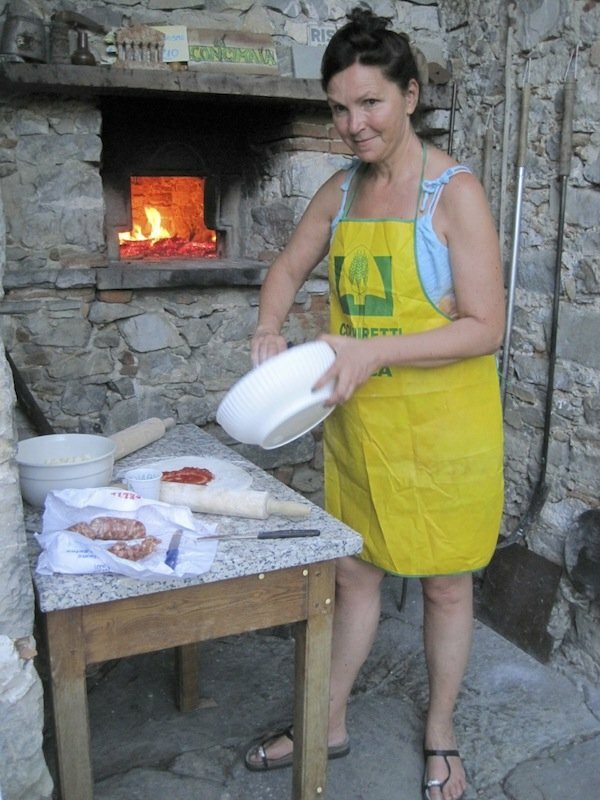 Which hotel would organise a pizza party specially for you at which you learn to make pizza in a wood-fired oven? 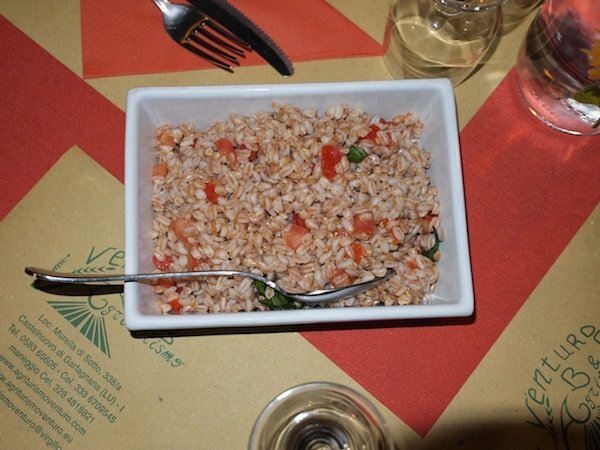 All Francesca’s friends arrive, many of whom speak some English, and you become an honorary Italian. As perfect as Al Benefizio is, it’s not suitable for groups of individuals or couples, each of whom wants a room with en suite bath. Francesca helped me find Agriturismo Venturo, higher up the Serchio River Valley from her. Real life happens at Venturo. 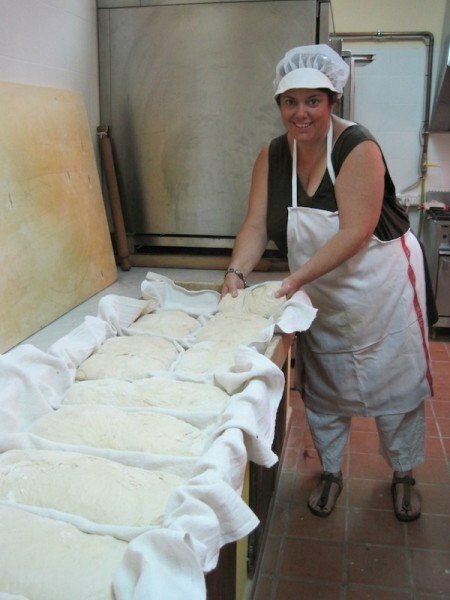 My guest Rebecca learns how to make bread at Venturo. 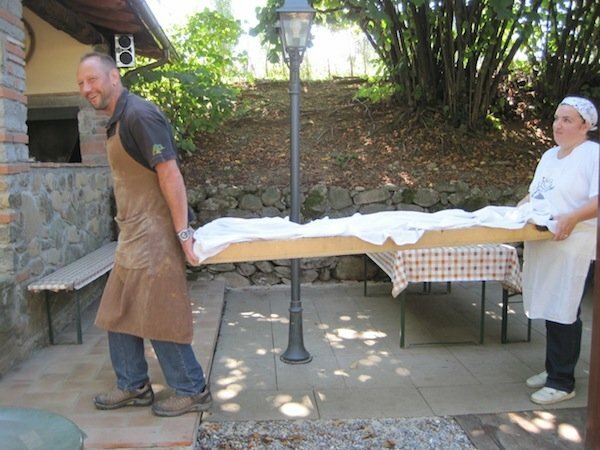 Off goes the bread to the wood-fired oven. 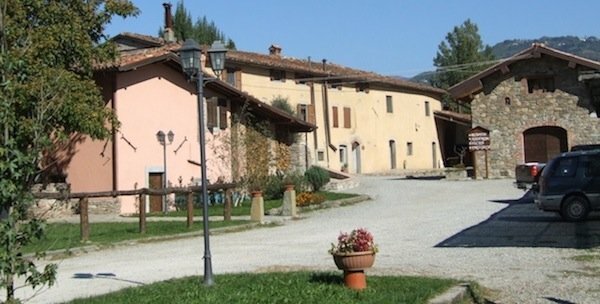 cleans the pool and supervises building works, converting yet more old farmhouses and buildings to guest apartments. 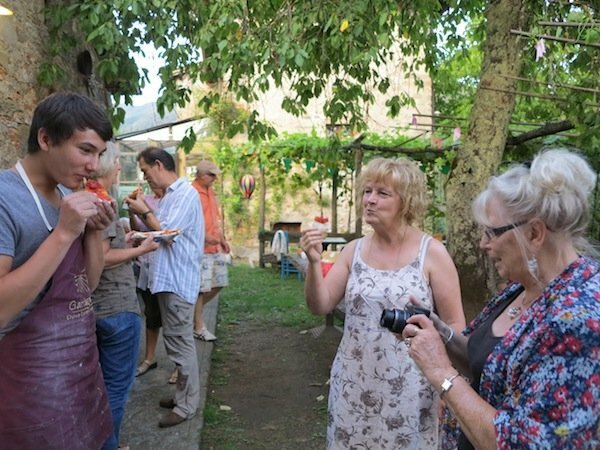 Oh, and he has a tiny café which he mans from 5 to 7 am when a local woman comes to relieve him, and he scoots back to the farm to light the bread oven and then up the mountain to feed the pigs, cattle and donkeys. 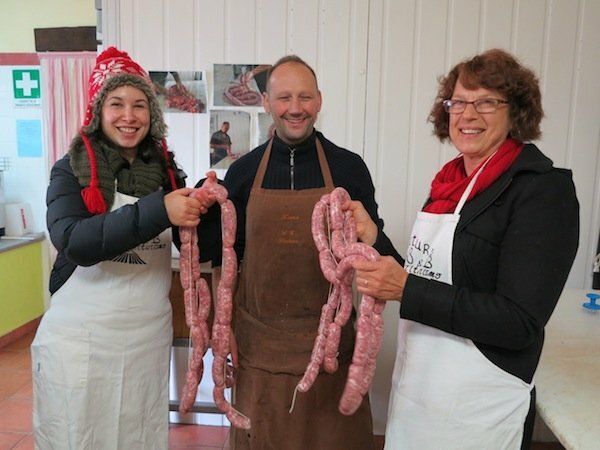 The Turri family welcome your interest in everything they do. 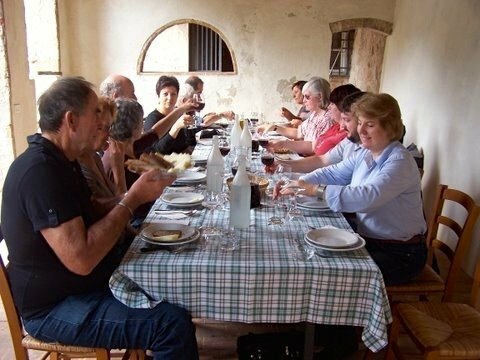 We usually have a sausage and polenta lesson, and walk to the water mill where the corn is ground. Ismaele is a good teacher! 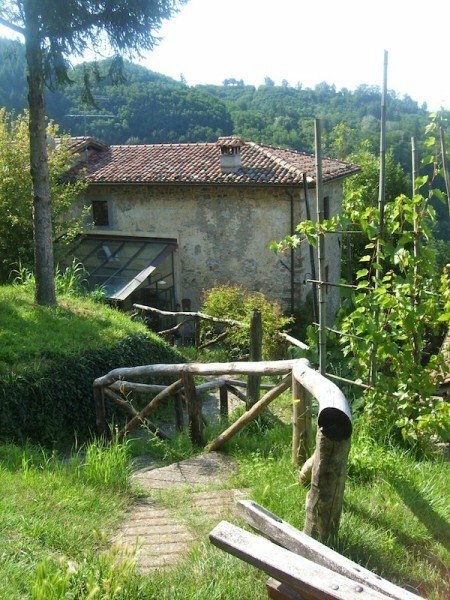 But you’re also free to lounge by the pool, walk in the woods, ride horses at the stables across the lane, walk into town and explore the hinterland of the Garfagnana. 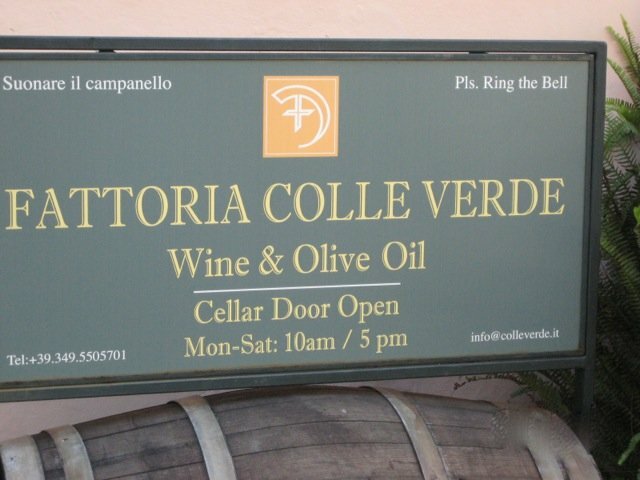 It was the wine that first attracted me to Fattoria Colleverde and its owners Piero Tartagni and Francesca Pardini. 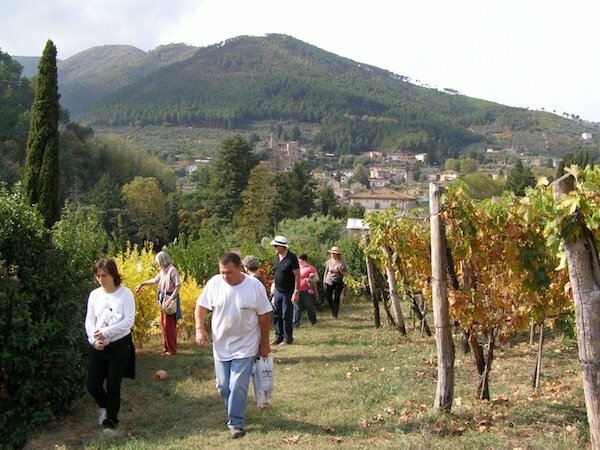 The vineyard and its buildings formed part of the Guinigi estates, from which the Pardini’s are descended. 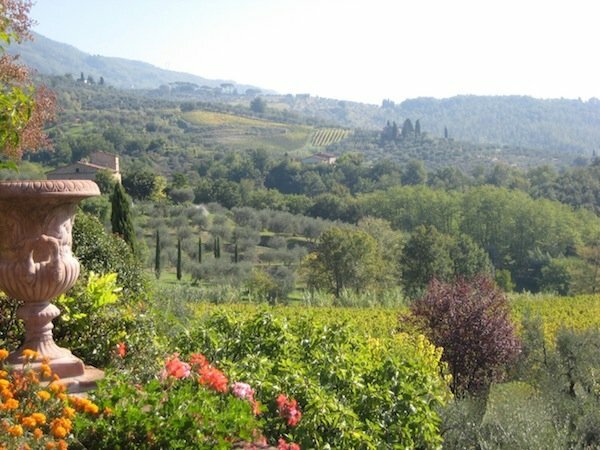 The landscape is all rolling hills, olive groves and vineyards. When I think of Colleverde, I feel warm sunshine flooding over me. 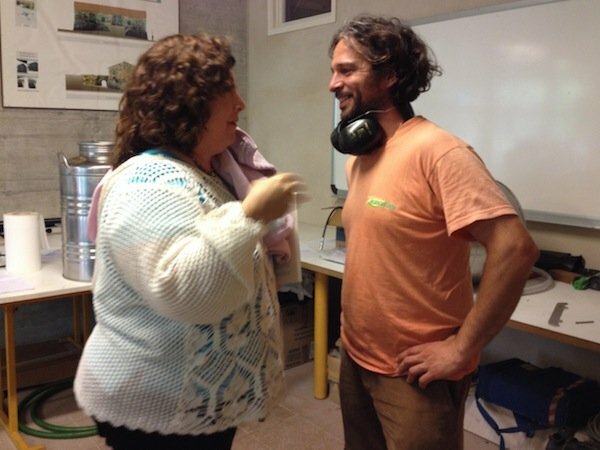 Piero is a filmaker and both are interested in art. 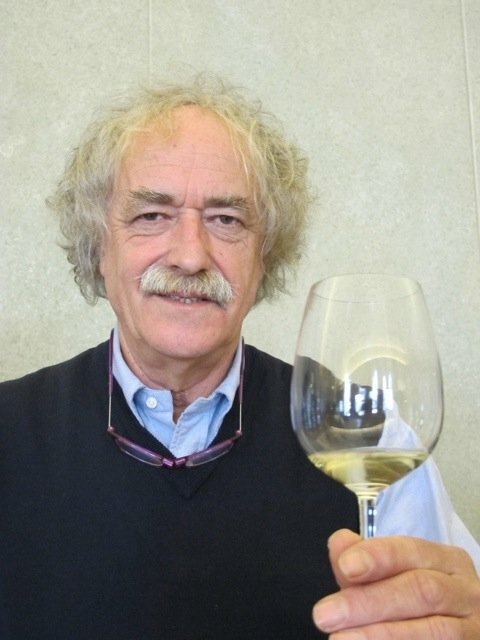 If you can manage to engage Piero in conversation, you’ll find his English nearly impeccable, and that he’s widely read in English literature plus much else. A true Renaissance man. This is a place for families who can share bathrooms or friends who don’t mind stepping outside their bedroom to get to their private bath. 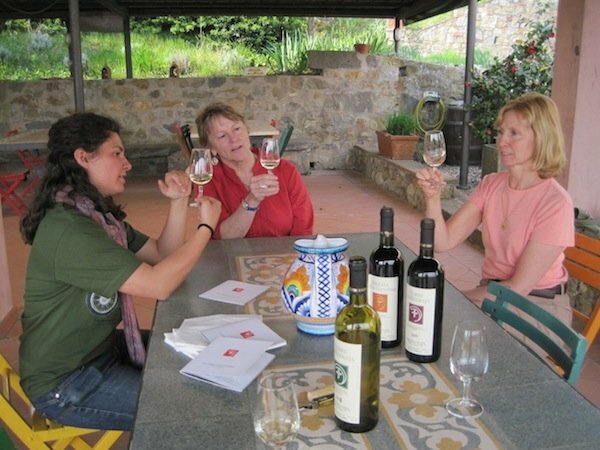 If you decide to cook in your own kitchen, at least one of the seven excellent biodynamic wines plus a sweet dessert wine and grappa will compliment any menu. 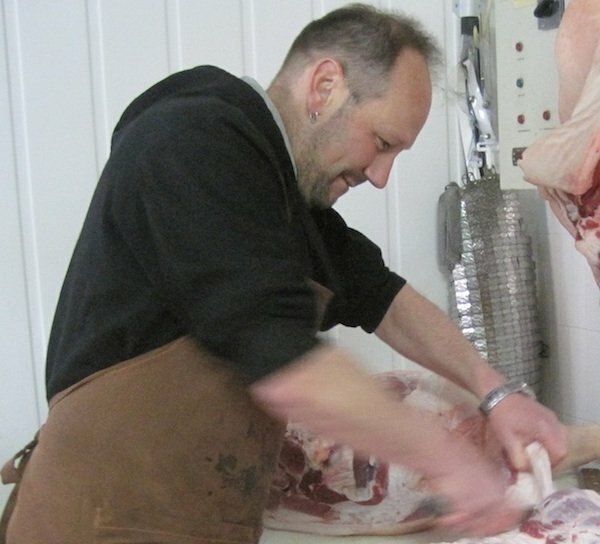 In the village up the hill, there’s a family pork butcher where I take my clients to find out all about salumi. 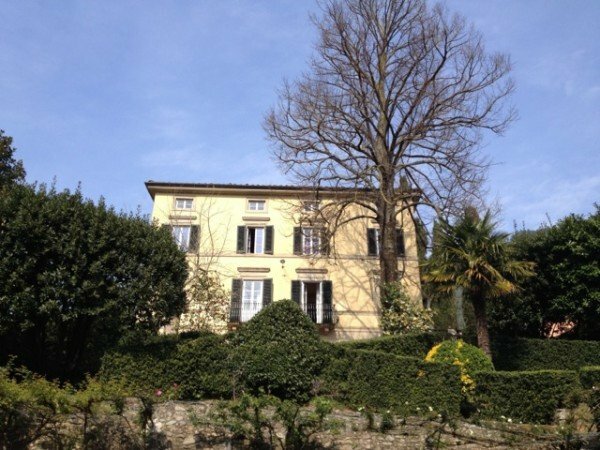 Lucca is a 20-minute drive away, so it’s the ideal place to combine rural and urban culture in one stay. 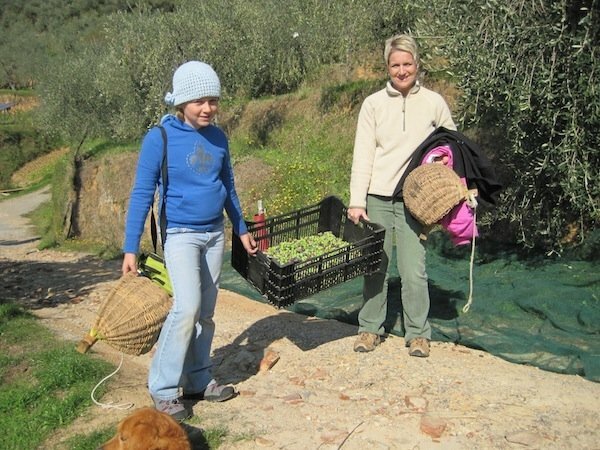 I put my guests at Alle Camelie for the activities they can do right on the farm, especially in autumn during the olive harvest. On the slopes of the Pisan Mountains, Claudio Orsi and his wife Eleonora farm an organic olive estate that has been in the Orsi family for several generations. 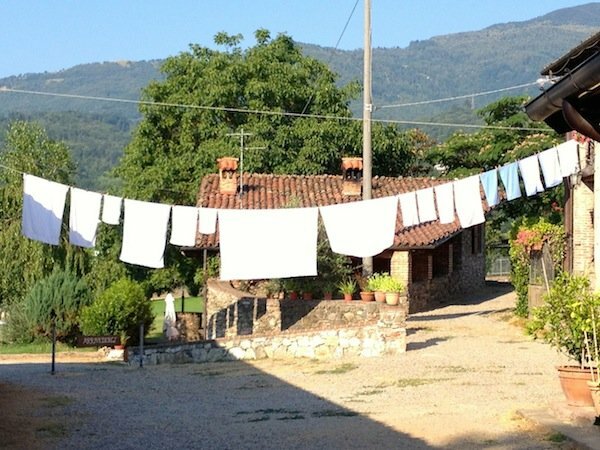 They live in the villa, and guests stay in the adjacent farm buildings, converted in authentic Tuscan style by Claudio’s father Augusto. 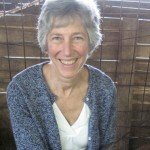 Every year new solar panels sprout from the roofs so now the farm is nearly self-sufficient for energy. 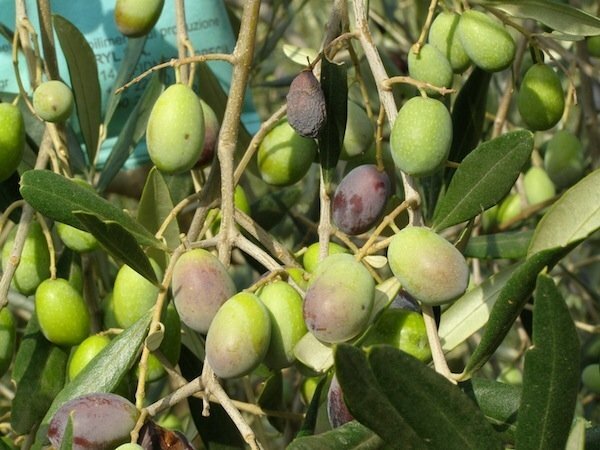 From the end of October and throughout November you can help pick olives and see them pressed into oil at the olive press on the farm. Look at what we picked! 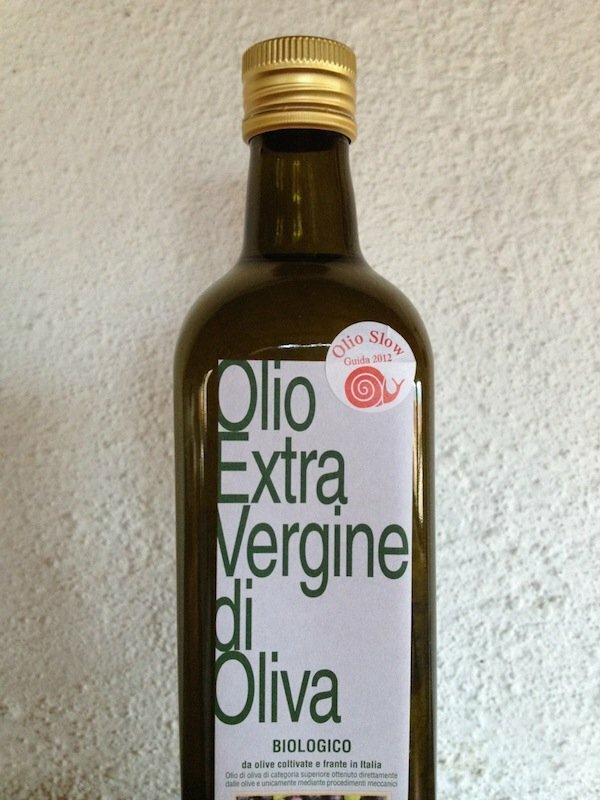 There’s always something you need to ask Claudio at the olive press. Claudio’s school friend Elena is an accomplished cook. She and Eleonora prepare meals for guests, simple dishes with an intensity of flavour that comes from using the freshest local ingredients. November is also the time for foraging for wild edible plants. 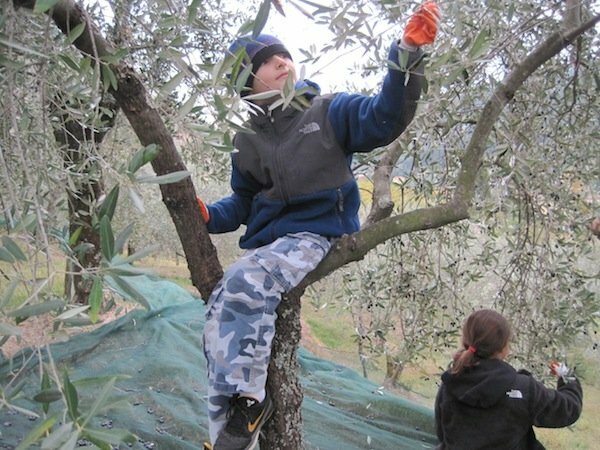 You can participate in a tradition that’s being kept alive by young people like the Orsi’s and their colleagues in Slow Food Lucca Compitese. 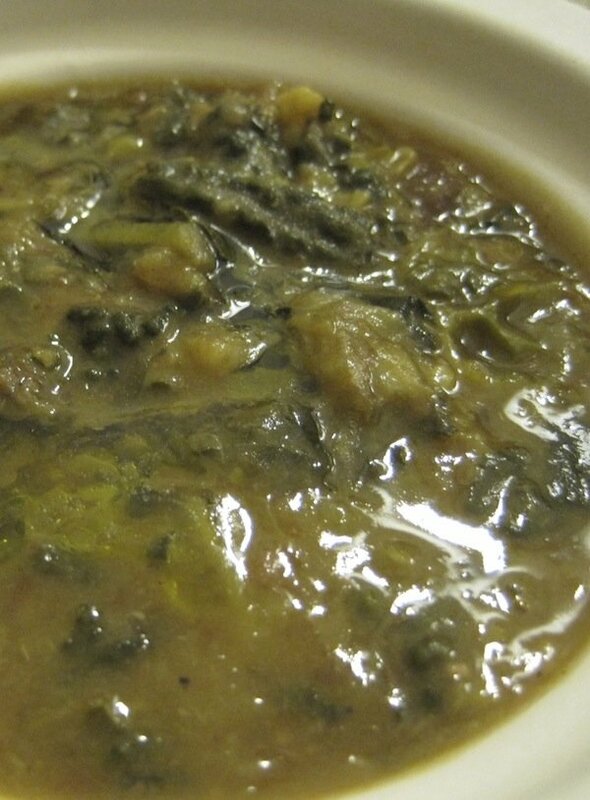 Near Lucca we make zuppa using wild plants and new olive oil. If you yearn for urban pleasures, Lucca is only 20 minutes away. 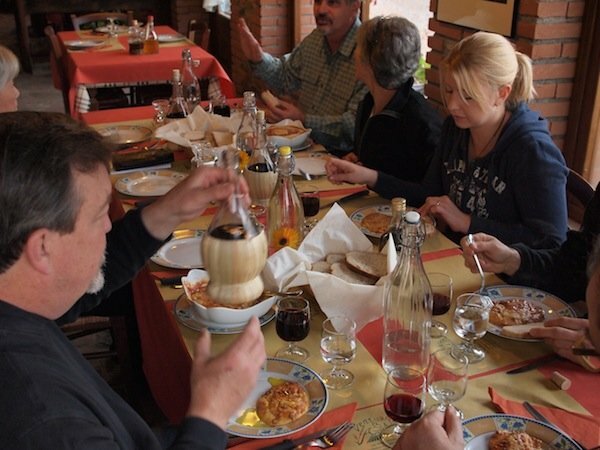 Lots of authentic Italians also live in cities, but it’s much harder to get to know them. 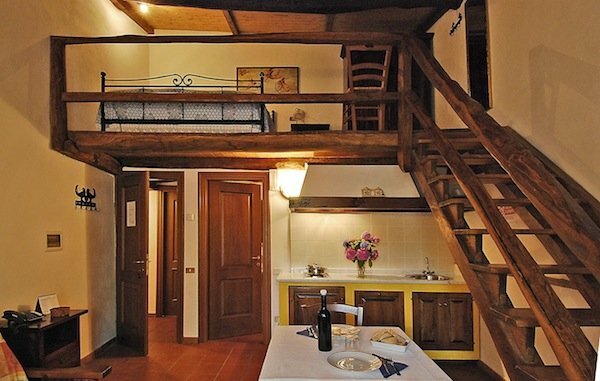 To have a more personal acquaintance with Italians being Italian, stay at an agriturismo. So many of my favorite memories at the above locations with Heather! 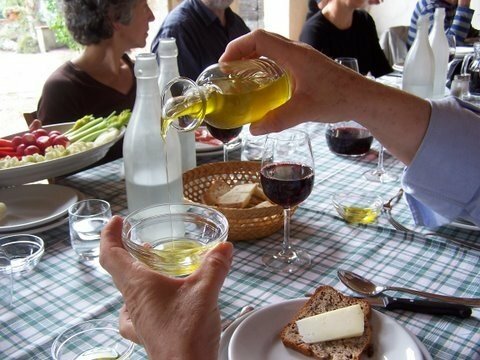 An amazing tour guide where you leave never accepting store bought olive oil again and you understand how much work goes into cheese and honey and bread…these days have been life changing for my family.